I don't know how to decorate the nursery as we are currently living in a Rental house and are unable to paint the walls, or put any holes/nails/hooks in them!! Please help!! I need some decorating ideas that do not include painting or hanging anything up! All your advice will be much appreciated. My third nursery decorating suggestion for a rental is to use the 3M range of stickable hooks to hang things on your wall. Just choose the right hook for the weight of whatever you want to hang and follow the removal instructions carefully when you take them down - again - no paint damage! and sheer fabrics for gossamer wings. I created my first toddler room entirely from little cut outs stuck all over the walls with blu-tack! It was such fun. Create a focal point in the nursery by using really colorful drapes. You can also stick soft toys to the window using rubber suckers, hang things from the finials, or apply removable transfers to the glass. Splash out on a really striking crib bedding set and complement it with matching colorful cushions scattered around the nursery, a matching lampshade and matching changing pad cover. Co-ordinating and matching your fabrics throughout the nursery will help to unify your design. Set up an eye catching floor lamp in one corner of the room. The taller it is the better - it will give your nursery design some height if you decide not to decorate the nursery walls. Choose a really unusual nursery mobile - if you can't hang it from the ceiling you could try attaching it to the bottom of the light fitting with twine. Fill the room with framed art on side tables, window sills, dressers etc. Invest in a nursery armoire with a striking design - this will also add height to your design if you leave the walls bare. Draw attention away from the walls by centering your nursery design around the rug. If you look carefully, you'll find that many nurseries have very little nursery wall decor. The trick is to find one outstanding item of nursery decor such as a rug or a colorful piece of furniture that will draw the eye. Or the other approach is to use a really understated color scheme against your white walls. Use fabrics with interesting patterns but fairly neutral colors and a few interesting items of decor to create interest. Beach nursery decorating fits well with white walls and it is really easy to create an effective look. Look through our baby rooms gallery for some more ideas for focal points. I hope this has given you a few starting points. Join in and write your own page! It's easy to do. How? 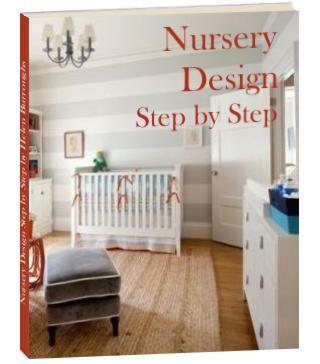 Simply click here to return to Ask Your Nursery Decorating Questions.